My grandson James has always had pretty sweet manners for a little guy. “Tank-tu” was among his earliest expressions. I seriously doubt that he understood the concept, however. He just realized that the use of those magic words meant he would be more likely to receive MORE of whatever it was. Still, I wonder if he really understands what it means. I wonder if I do. In examining my heart, I realize that thanking God is often a perfunctory ritual for me. Or possibly for the ulterior motive of receiving “more.” More blessings. More provision. More protection. There are moments, of course, when the sheer goodness of God overwhelms me and fills me to overflowing with inexpressible glorious gratitude. Giving thanks doesn’t always come naturally to me. But I believe it is something that can be cultivated with practice. Thank comes from the same root as Think. Basically, to think and feel gratitude. The outward articulation should be a reflection and expression of the inner attitude. Fortunately, the auditory articulation then reinforces the thought… strengthens the neural pathway. Although my thought-life has been mostly wild and unbridled throughout my life, I am realizing more and more just how much control we humans actually have over what goes on in there. My mini-education in Brain Science has confirmed scriptural truths in this regard. Science asserts that it is possible to retrain the brain. Spiritual truth teaches that it is possible to renew the mind. I desperately want to develop a greater level of intentional gratitude. I want to train my brain to think thanks almost as an involuntary reflex. I want to restructure the inner pathways to “Oh, yes!” instead of “Oh, no!” no matter what is going on. Consistent effort. There may be a lot of negative thoughts to chase, capture, and imprison where I can no longer hear their lies. If I want to think thanks, then I am going to have to practice praise as a spiritual discipline. I know that will not always be easy. There may be times when I do it through figuratively clenched teeth. But it will be worth the effort if I develop a deeper understanding of what it really means to give thanks. We had walked to the little market down the street to pick up a few staples. I had to remind him to thank me for buying him a begged-for treat. “What do you say?” Magic words. Obligatory thanks. It had been a tiring day, and I strolled him home slowly. A sudden noise made me turn around. Behind us, the November sky had turned a brilliant aqua blue. It was dark and light at the same time. Dusk, but still vivid. The dazzling full moon played hide-and-seek with the impossible pink clouds racing across the sky. It was shockingly beautiful. I knelt down on the sidewalk by James’ stroller. I wanted to make sure that he could see the show from his vantage point. “Yes, I see them,” he nodded through sticky lips. “Just beautiful,” I said again, under my breath. He nodded and clasped his messy hands. Kneeling on the sidewalk, a rush of organic joy and awe and gratitude came flowing out. It was a purer form of praise. How timely and how appropriate. Once again, I go to your blog and find EXACTLY what I need to hear! Yesterday I was on the road traveling to north Alabama for my job. I saw a sign on a church marquee - "We don't need more to be thankful for. We need to be more thankful." Amen. Kim, what a beautiful relationship between you and James. What an example you set in showing him how to develop a grateful heart. I saw this post thru my friend Mackenzie. I love your post and the photo. 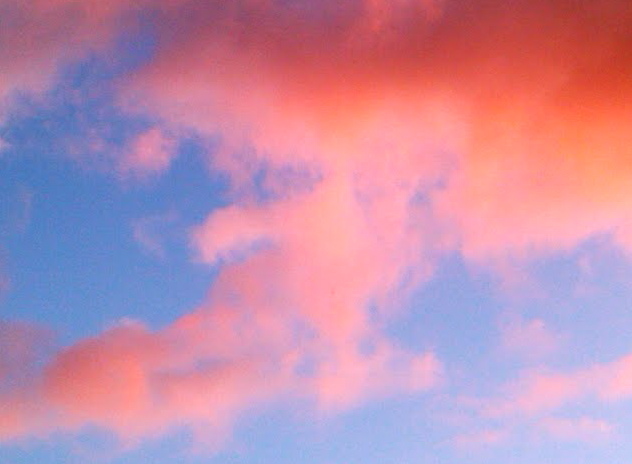 My grandmother always said her favorite color was skyblue pink, we"d say what"s that? and she'd show us whenever the sky was like that. You reminded me of a sweet memory with her.